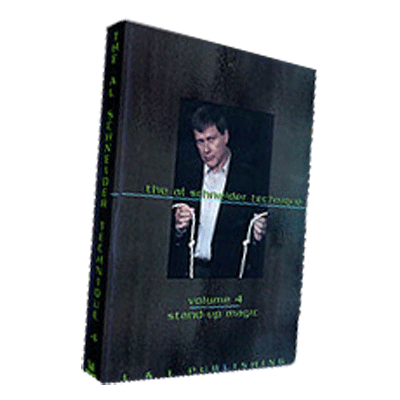 Though he is known for his legendary close-up magic, Al Schneider is also an accomplished stand-up performer and on this volume, he performs and teaches a 15-minute act that's all packaged and ready to do. Add some practice and you'll have a powerful show for any occasion. LINKING RINGS - A classic five-ring routine that's a great opener for any stand-up act (though it's strong enough to be your closer!). Simple and direct. ROPE - A knot routine that's warm and engaging. Knots appear suddenly and disappear just as suddenly! You must know how to do this to have any respect as a rope magician! GOLF BALLS - A complete act in itself! A ball is produced from a silk scarf, and then three more appear and then disappear. As a finale, the last ball changes into a giant golf ball in the performer's bare hands. What's more, this routine is performed entirely out of the pockets - no need for a table! COIN TRAY ROUTINE - A stunning routine with a well-known yet little-used prop - a simple coin tray. The spectator counts some coins and holds them tightly. The spectator gives the performer three coins. Each coin is placed singly into a handkerchief and then vanished. The spectator even touches the last coin while in the hank just before it vanishes. The three coins are found back in her hands. FUSION- Four single ropes are counted and with a snap, visibly become one length of rope. This is easy to do yet can be done completely surrounded. What's more, the rope can be passed out for examination immediately. ZOMBIE - This is the routine that inspired Tommy Wonder's work on this classic of magic. In the Schneider version, the ball seems to come to life and pick on the performer. This version can be done surrounded and even close-up! And, there's virtually no set up - just pick up the ball and go! It's a routine designed to win over even the toughest audiences!